We mention visiting with Sasha, the amazing Spin Doctor. Gigi has been working on Dr. Watson, her TEFKAKO project, also on a vanilla sock out of Loops and Threads Luxury Sock Yarn. Jasmin has been working on her Blueflame socks, from Lisa Sousa's Hardtwist. She has started a new project, socks out of Fabel Prints by Drops. Our listeners are awesome, Team Knitmore collected over 900 hats for Halos of Hope. We mention Namaste, and their Harlow bag.We will be announcing winners next week, after the totals are officially announced. We got to meet The Knotty Girls, The Knitters Brewing Company, we mention Melanie of the Savvy Girls. The play by play of our Stitches West experiences can be heard on Dr Gemma's Cogknitive podcast. We mention our lunches from Specialties, and talking with Steve Malcom. CEO of XRX Publishing, Stitches and charming host of the Fiber Hooligan podcast. 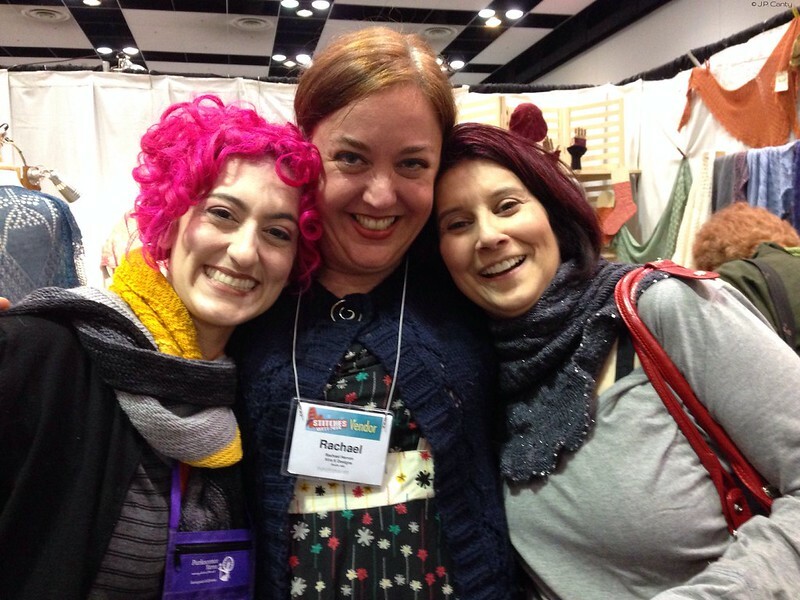 We hung out with the 2 Knit Lit Chicks, Just Another Bay Area Knitting Podcast, Abby of Knit Knit Cafe, and Elizabeth Douherty. We talk about the fashion show, and the new book by XRX, Knit in New Directions , by Myra Wood. We mention Rick Mondragon, editor of Knitters Magazine. We mention Gigi's "How to sew in a label" demo, and lever knitting. Best of Show:We are charmed by the Yarnover Truck. And we love Erin Lane Bags, and her bag club. Cephalopod Yarns. Knitter's Brewing Company (Team Sockoholic) Kits, especially Fangs!, Nordic Mart. Amy Herzog's Custom Fit site (and her book ). Western Sky Knits, Rachael Herron , Miriam Felton, Romi Hill, Barmaids. We mention the Yarniacs, Stash and Burn, the Knitting Rose, Galina Khmeleva , Alana of Never Not Knitting, Marly Bird of Yarn Thing. Hug. Curious George modeled Genevieve's Little Oak Cardigan in the Cephalopod booth. We purloin the amazing grosgrain ribbon treatment that Dataknitter did on her Cassidy. Misattributed: is her Acorn Sweater. This week we review Lit Knits, by Audry Nicklin. We also gush about her Southern Skies, Celestarium and the new Equatorial Nights. Gigi did not place, she didn't even finish the back of her Dr. Watson sweater, much less finish the whole sweater. 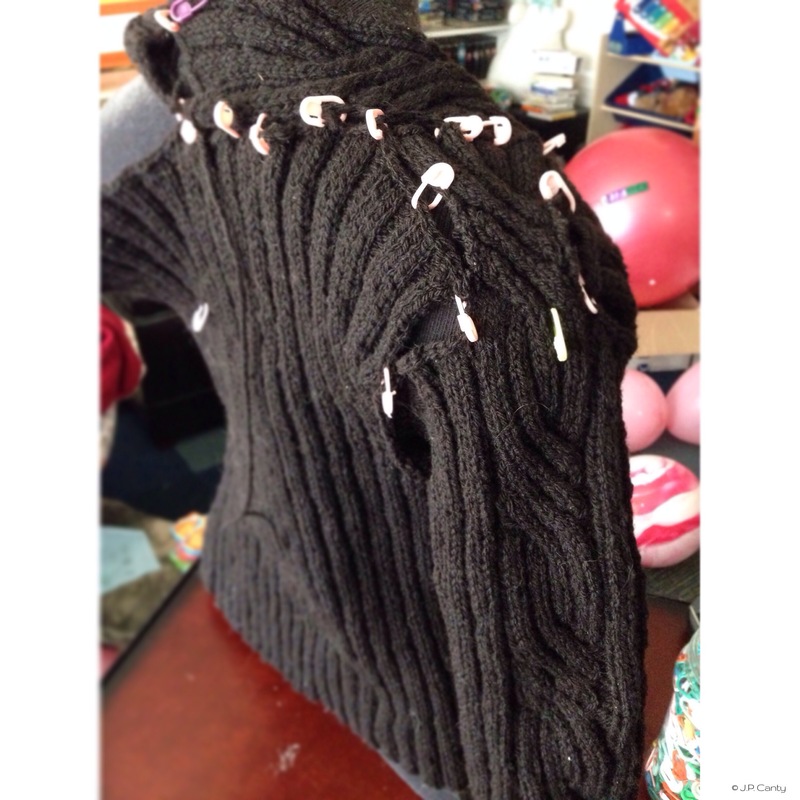 Jasmin also ran short on time, but made good progress on her project, her SPAKAL sweater. Gigi mentions her Spin U class at Purlescence, and her homework assignment. With the Tucson Gem and Bead Show behind them, Bat-Maids makes their way up the California Coast to Stitches West in Santa Clara. Their newest scent, Juicy Pear will be featured as well as Southern Comfort, Fine Line Serum, and Lo-Lo Baby. If you are in a hurry, grab an Order Up card, fill it out and pick up your order later. Those gals will even text you when your order is ready. You can find the Bar-Maids in booth 1035/37. This Episode we have a guest: the fabulous Sasha Torres of the Spin Doctor podcast. Sasha is working on the Simple Things shawlette by Mary-Heather Cogar that she dyed herself at the Stained Finger Dye Camp, hosted by Kim McBrian from Indigo Dragonfly. Gigi has blocked the Leafwise shawl, designed by Sivia Harding. Sasha is also knitting socks for her husband out of Abstract Fiber in the color Koi Pond. Jasmin mentions her Boneyard shawl. Jasmin is finishing her second Dark Side of the Moon socks by Fab Funky Fibres.sock. Also, she washed her 15 Color Rainbow socks from FabFunkyFibres, Tis socks, and Sgt Pepper, and they game out of the washer dryer just as vibrant. She is also thrilled about the socks she is knitting out of Hardtwist by Lisa Souza in Blue Flame. She is thrilled about the design of the SPAKAL sweater, even if the yarn is too dark to knit at night. The Meet-and-Greet is scheduled from 11:30 to 12:30 on Saturday the 20th in The Purlescence Yarns booth (Booths 804, 806, 808, 903, 905, & 907). - A lovely skein of Lollipop Yarn in the colorway Sweet Child o' Mine. $100 gift certificate from Namaste. Details about getting labels mailed to you (from us) to be announced after Stitches. Also, if our team wins, we will have a drawing to give the podcaster fashion show tickets to a listener who donated a hat. 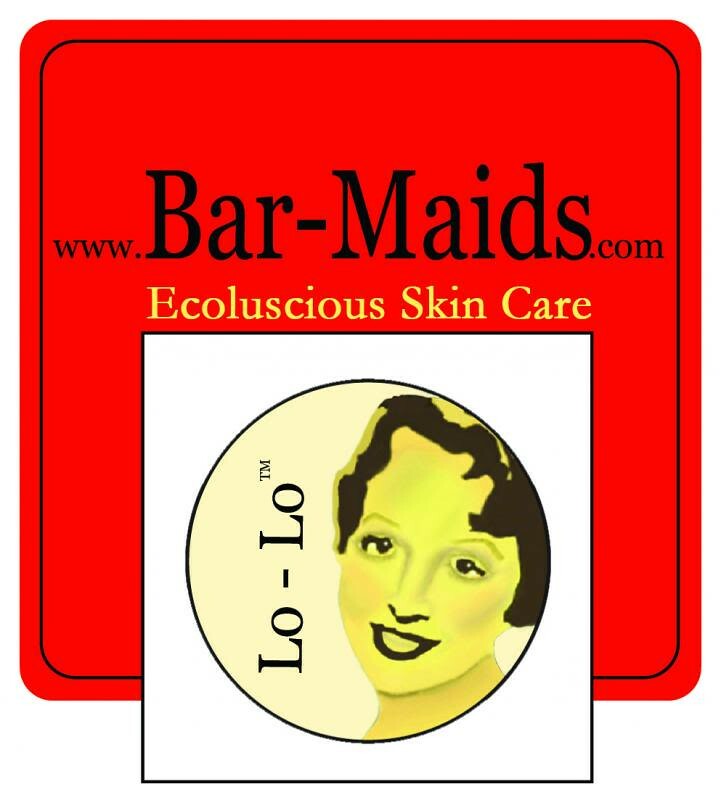 Watch out for the 20% off everything Barmaids coupon in our swag bags. We mention our List of Stitches West Tips, and the Tracking Expenses Printout. Sasha wore the Easy Drop Stitch Scarf out of Manos Yarn. As soon as Gigi has blocked it, younger brother Sam will be wearing the Color Affection that Gigi has knit for him. Jasmin mentions Allison Jepson Hyde, author of Wrapped in Comfort . Gigi mentions that she wants to knit the Color Affection shawl out of KidSilk Haze. Jasmin suggests that she consider Superior cashmere silk blend for this project. Jasmin wore her Citron out of Abstract Fiber Supersock in the Knitmore colorway. Genevieve wore her Squirrel sweater. Jasmin washed the sweater in Soak. She mentions Zorbeez , and Tiny Tots cloth diapers. Genevieve also wore her Playful Stripes sweater, and Jasmin mentions Annie and the Swiss Cheese Scarf . Gigi mentions her Rocky Coast cardigan. Jasmin talks enthusiastically about drying her sweaters on the OXO Sweater Dryer . She mentions Handworks blocking wires, and Knitters' Blocks blocking mats, which are sold through Cocoknits. This week we answer questions from the "What to you want to hear about?" 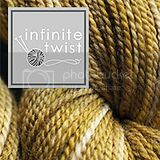 thread, about various fiber content in yarns, and how to wash socks. Gigi talks about her visit to the San Jose Museum of Quilts and Textiles. It is accessible through public transit. We mention Tess Ribbon, and Brooklyn Tweed (Jared Flood) photography. Sasha was attacked by the moth eaten yarn of a friend. Gigi dropped a stitch on her TEFKAKO, the Dr Watson sweater, and had the hardest time figuring out what had gone wrong. Gigi is worried that she wont reach her TEFKAKO goal in time. Jasmin is working hard on SPAKAL sweater. Gigi has finished her Trekking Vanilla socks, and Vanilla socks out of Schoppelwolle. 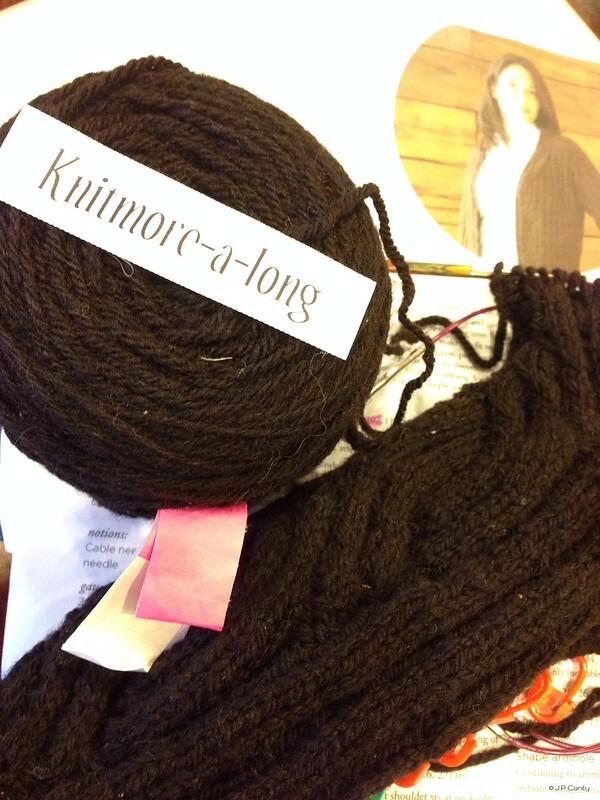 Jasmin worked on the Barberry Kids cardigan for the #matchymatchy KAL. She picked a night time project and got Hardtwist in Blue Flame by Lisa Souza, which is a lovely rainbow yarn, and is knitting socks on 2.25 needles. She mentions the Watercolors sockyarn, by the Periwinkle Sheep in the Yarn Harlot colorway. She has been wearing them regularly since 2009, and says they still look brand new. She is going to cast on the "Lucy's Hair" colorway next. Gigi finished the 'Tis socks. She also cast on another pair of vanilla socks in Loops and Threads Luxury Sock yarn in the "Balloons" colorway. She sewed buttons on two Button Tab Knit Hats, and dropped of another 6 hats at Purlescence, which brings her total to 20 hats. We announced a new prize: $100 gift certificate from Namaste. The only knits Gigi has been wearing are socks, wristers and a cowl. Jasmin has been wearing her Blue Streak cardigan, The Yarn Girls' tunic, and her handspun Ribbi Cardi. Genevieve has worn her Little Oak cardigan out of Cephalopod Yarn, an acrylic sweater Jasmin knit in high school, her duck sweater, and she snuggled under the Love blanket, and wore her Molly hat. Andrew has been wearing his ten year sweater. This week we answer a question from the "What to you want to hear about?" thread, about a sweater gaping in the front. We also respond to a question about hand fatigue. Jasmin mentions Carson Dehmer's ergonomics class. Gigi mentions the paraffin bath she got at Bed, Bath and Beyond. Gigi was repeatedly attacked by her cast on. Jasmin was attacked by the cables on her SPAKAL sweater for her Ravellenic Knitting. Also, the socks she is knitting turned out too big, the issue being the difference between US 2.75 instead of US 2.25 needles. Gigi was working on her Dr Watson sweater for the TEFKAKO, (The Event Formerly Known As The Knitting O******s), and discovered it was too tight. Frogged. This week we are purloining "Yummies" from the Geeky Girls Videocast, hosted by Cece and Damaris. We are watching the new season of Downton Abbey , the new season of The Walking Dead , Switched at Birth , and a lot of Sesame Street with lovely musical cameos. StitchMistress has given Jasmin new suggestion for interesting tv. Also, Gigi is looking forward to watching Under the Gunn (CAUTION: NOISY SITE), hosted by the very dapper Tim Gunn. Gigi is knitting the Dr Watson sweater from the new Sherlock series. Jasmin is trying to finish her SPAKAL sweater for her TEFKAKO project. Genevieve is starting to treadle for a few minutes at a time. Jasmin mentions Annie and the Swiss Cheese Scarf , and Woolbur . Jasmin is spinning on the Merino Border leicester Cross and needs some variety. She perused her stash and found fiber from a Cognitive Retreat, Smoky Mountain Fibers, in the colorway Summer Fruits, that she wants to spin a worsted weight. Jasmin is enjoying working on her Matchless. Genevieve is helping her spin punis from Gourmet Stash. Gigi is thrilled with the spinning course she is taking at Purlescence's Spin U. She has learned to ply, how to control the consistency of her yarn, and how to determine what thickness to spin. She is purloining technique from Leslie from the Knit Girllls videocast. Jasmin mentions Judith MacKenzie McCuin's The Intentional Spinner and automotive paper towels . Gigi mentions her Julia Louet wheel, and tells the story of the lace flyer. Gigi sewed Halo hats out of polar fleece. The Halo hats on the website have three different sizes, but the top of the hat only comes in one size, which is a problem. Gigi also is working on a different series of hats in five different sizes. Also, she looked though the new McCalls catalog and mentioned the sale on patterns at Hancock's, which she mistakenly attributed to Joanne's.